Everything Dinosaur has received reports from Chinese news agencies that a dinosaur exhibit in the Zhucheng Dinosaur Museum (Shandong Province, China), has been recognised by the Guinness World Records organisation as being the largest hadrosaurid skeleton on display. The duck-billed dinosaur skeleton is part of an exhibit showing a herd of Shantungosaurus dinosaurs in the entrance area of the huge museum. In the press release, the dinosaur is referred to as Zhuchengosaurus maximus, but this is regarded as a junior synonym of Shantungosaurus giganteus, the mounted skeleton stands 9.1 metres high and is 16.6 metres long. The magnificent Shantungosaurus dinosaurs on display in the entrance hall at the Zhucheng Dinosaur Museum. Largest Biped to Have Ever Lived? With the recent hypothesis that Spinosaurus (S. aegyptiacus) was a quadruped and incapable of walking on its hind legs, Shantungosaurus, is regarded by many palaeontologists as a facultative biped (able to walk on its hind legs if it wished to) and as such, the largest biped known to science. Body length and body mass estimates are difficult to calculate, but the mounted exhibit examined by the Guinness Book of Records, exceeds fifty-four feet in length, and one of the neighbouring Shantungosaurus mounts at the museum is almost as long. As for bodyweight, estimates vary, but Gregory Scott Paul has estimated that this dinosaur could reach weights in excess of fifteen tonnes, that’s getting on for being twice as heavy as a T. rex! The Zhucheng Dinosaur Museum is one of the largest museums dedicated to the Dinosauria anywhere in the world. It celebrates the rich fossil heritage of Shandong Province and Shantungosaurus giganteus was named in honour of this coastal province in eastern China. The record breaking exhibit, does not represent a single, individual animal. When remains of the giant Ornithischian dinosaur that was to be named Shantungosaurus were first found in the mid 1960’s, fossils from at least five individuals were found together in an extensive bone bed. Although, none of these specimens represented a complete skeleton, the bones (and casts of missing fossils) could be assembled into a single mount. A scale drawing of Shantungosaurus. Named in 1973, Shantungosaurus lived during the Late Cretaceous and it is one of a number of Ornithischian dinosaurs known from this part of the Wangshi Formation of eastern China. A second, equally sized hadrosaurid was described in 2007 – Zhuchengosaurus maximus and the Chinese press agency referred to the record breaking exhibit using this nomenclature. However, Z. maximus, named and described in 2007, is probably a junior synonym of Shantungosaurus giganteus. Anatomical features used to distinguish the fossils as a separate species when Z. maximus was named in 2007 were later to be found to be related to ontogeny (different aged animals with differences in growth). A similar fate befell a third giant Hadrosaur Huaxiaosaurus (H.aigahtens), it too is now regarded as a junior synonym of Shantungosaurus. Whatever the position regarding the validity of these other genera, it is certain that this part of China in the Late Cretaceous was home to some truly huge duck-billed dinosaurs, why these animals grew so big remains a mystery. Perhaps an abundance of food resources permitted larger and larger generations, or maybe a larger size helped avoid predation? The naming of a new genus of tyrannosaurid (Zhuchengtyrannus magnus) in 2011 may help explain the reason for the very large size of these particular duck-billed dinosaurs. The 2016 Lyme Regis Fossil Festival is in full swing. After a successful day yesterday with around two dozen primary schools attending, Friday is dedicated to supporting secondary schools, those pupils at Key Stages 3 and 4 of the English national curriculum. Local fossil expert Brandon Lennon reports that there were some strong winds battering the Dorset coast earlier in the week, this affected the build up to the Festival but all the marquees were erected and everything made ready for what will be four days for frenetic fossil themed activities. Lyme Regis prepares for the 2016 Fossil Festival. Even in bad weather, Lyme Regis is picturesque. This part of the “Jurassic Coast” tends to have its own micro-climate, a phenomenon that team members at Everything Dinosaur have experienced themselves. It can be raining in Sidmouth (Devon) to the west, but the Lyme Regis and Charmouth areas stay dry. The weather forecast for the weekend, the public open days of the 2016 festival, is much better. Strong sea breezes are still in the forecast but it is going to be dry and as a result, even more visitors are expected. It is going to be a busy couple of days for the organisers and the exhibitors. All is ready for the Lyme Regis Fossil Festival 2016. One of the best ways to enjoy the geology of Lyme Regis and Charmouth is to take part in a guided fossil walk. There are a number of these walks built into the programme of the Festival itself, but other walks are available throughout most of the year. For those who would prefer not to explore the beaches themselves, there will be lots of fascinating fossils on display in the marquees. Many of the specimens on display have been found in the Dorset area and can be purchased, there will certainly be many different Ammonites to choose from, if Chris Moore’s trade stand is anything to go by. A splendid display of Lyme Regis fossils. It looks like there will be one or two bargains to be had. There will also be plenty of opportunities to discuss the ancient fauna of Lyme Regis with the multitude of local fossil experts who will be attending this year’s event, in addition, visitors have the chance to meet scientists from the Natural History Museum, British Antarctic Survey, Palaeontological Association, Plymouth University, Natural England, Jurassic Coast Trust, Dorset Geologists, Geological Society, Lyme Regis Museum, Charmouth Heritage Coast Centre, National Trust, Dorset Wildlife Trust and the National Oceanography Centre. We wish the Festival every success and we look forward to hearing more about the 2016 Lyme Regis Fossil Festival over the weekend. When is an Iguanodon Not an Iguanodon? Yesterday, Everything Dinosaur reported on the discovery of a giant whale tooth found in Beaumaris Bay (Victoria). This significant fossil find, once again highlighted the importance of amateur fossil hunters when it comes to contributing to the Earth Sciences. You don’t have to travel all the way to Australia to play your part, sometimes the geological collection housed at your local regional museum can provide an opportunity for you to make you mark. Take for example, the vertebrate fossil collection at Dorking Museum and Heritage Centre. Student Tom Fedrick has helped re-classify dinosaur tail bones originally described as belonging to an Iguanodon, but keen-eyed Tom, using knowledge gained from four years volunteering at the Museum, concluded that a centrepiece of the collection represented the bones of an entirely different, albeit related dinosaur – Mantellisaurus. On display at the museum. Much of the fossil collection is currently being catalogued digitally. This will enable the collection to be accessed by other museums, researchers and academics. A-level student Tom has been working on this substantial project and having completed work on around half of the collection, he turned his attention to the Iguanodon exhibit. Tom, a student at Reigate Grammar School oversees the cataloguing of the dinosaur bones. The fragmentary nature of iguanodontid fossils excavated from various locations across the south of England have presented palaeontologists with a number of taxonomic puzzles to solve. Iguanodon was the second dinosaur species to be named and described (although the genus name was erected before the Order Dinosauria had been established). Gideon Mantell named Iguanodon, but at the time his paper was published, he failed to establish a holotype or indeed assign a trivial name to his specimen. From that point on, the Iguanodon genus became a sort of dumping ground for any large Ornithischian dinosaur fossil material excavated from the Weald Clay Formations and the contemporaneous Wessex Formation of the Isle of Wight. Mantellisaurus atherfieldenis was established in 2007 by the American Gregory Scott Paul. It is a more gracile animal than the robust Iguanodon bernissartensis and considerably smaller, perhaps around seven metres in length. Analysis of the forelimbs suggest that Mantellisaurus spent the majority of its time as a biped, although it could adopt a four-legged stance when desired (facultative quadruped). The picture above compares the skeletons of three types of iguanodontids. Although, Gregory S. Paul regarded Dollodon bampingi as a valid genus, more recent research suggests that Dollodon might be a synonym of Mantellisaurus. The term “Nomen dubium” is given to any organism whose validity is in doubt. This is the second time that a fossil specimen has been reclassified after research undertaken at the Dorking Museum and Heritage Centre. Last year, Everything Dinosaur reported upon the reclassification of a marine reptile specimen, thought to have represented Polyptychodon interruptus. Dorking Museum opening times: Thursday, Friday and Saturday, 10am – 4pm. A fossil tooth of a giant, prehistoric whale found on a beach by an amateur fossil hunter has provided scientists with further evidence of monstrous whales that once ruled the oceans of the world. The tooth, which weighs around three kilogrammes and measures a whopping thirty centimetres in length is not even complete, the tip of the crown is missing and the base of the root has broken off. However, it is easily the biggest fossil tooth ever found in Australia. Palaeontologist Dr. Erich Fitzgerald holds the fossil whale tooth. The fossil was discovered back in February by Murray Orr as he explored the famous Beaumaris Bay area to the south-east of Melbourne (Victoria). The sandstone cliffs and foreshore of this bay represent sandstone deposits laid down between ten and five million years ago in an estuarine and marine environment. The strata preserves fossils of a huge number of invertebrates as well as the fossilised bones of penguins, ancient seals, sharks and other fishes. The bones of giant birds have also been found along with fossils representing terrestrial marsupials whose bodies must have been washed down the Yarra River and out to sea. Such is the importance of the Beaumaris Bay area and the Pliocene-aged strata that a lobby group has been formed to help preserve the two mile long beach area by awarding it UNESCO World Heritage status. The tooth is estimated to be around five million years old and would have come from a Cetacean similar to the giant of Peru – Livyatan melvillei, formerly known as Leviathan melvillei. Although the teeth are very similar, it is unlikely that the Australian tooth represents the same genus, as the Peruvian fossil material has been dated to around 12 million years ago, so the Beaumaris Bay specimen is considerably younger. The tooth is internationally significant, as it represents the first evidence of massive sperm whales present outside the Americas. The tooth is indeed immense and dwarfs a tooth from the jaw of an extant Sperm Whale (Physeter macrocephalus). It even makes the teeth of Tyrannosaurus rex look quite dainty in comparison. The fossil whale tooth (centre) compared to a T. rex tooth (left) and an extant Sperm Whale tooth (right). The picture above provides a comparison between the tooth of a Tyrannosaurus rex (left), the extinct fossil whale (centre) and a modern-day Sperm Whale (Physeter macrocephalus) on the right. Estimated size of toothed whale based on the fossil tooth – around 18 metres. Dr. Fitzgerald is no stranger to the Beaumaris Bay area and he has worked on a number of important fossil discoveries from this area. For example, back in 2013, Everything Dinosaur reported on the discovery of the first seal bones from this locality: Australia’s First Seal – A Pliocene Pinniped. As the fossil is believed to be around five million years old, it is the youngest known fossil of a whale-eating Sperm Whale. Extant Sperm Whale males can reach fifteen metres in length and they are predators but they only have teeth in their narrow, lower jaw. They specialise on feeding on squid and fish, the fossil tooth indicates that in the southern hemisphere giant marine, super-predators were geographically widely dispersed. The Beaumaris Bay area of Melbourne provides a remarkable insight into the ancient fauna of Australia. Giant marsupials roamed the estuary with seals and ancient penguins basking on the beach, whilst flying overhead giant toothed birds soared out to sea, where perhaps a massive toothed whale lurked offshore to pick off any unwary seals. Beaumaris bay, (Victoria, Australia) some five million years ago. CollectA have got so many new for 2016 prehistoric animal models coming out, that those clever people at JurassicCollectables have had to split their unboxing video into two parts. Everything Dinosaur sent out a complete set of these new for 2016 CollectA replicas and in this unboxing video the narrator takes viewers through a summary of the models that were included in the first batch of releases. It’s an impressive line up with the terrific Tyrannosaurus rex corpse up first and JurassicCollectables provide lot of amazing close ups of the injuries sustained by this unfortunate tyrannosaurid. Then it’s on to the hunting T. rex model as our narrator makes short work of the product packaging to reveal this replica in all its glory. Check out the 1:40 scale CollectA feathered T. rex video review on the JurassicCollectables YouTube channel. It has over ten thousand video views already and it has only been up a few weeks. The reviewer mentions that Everything Dinosaur supplies a fact sheet on every named prehistoric animal that we supply, we do like to go the extra mile when it comes to looking after our customers. We have several hundred prehistoric animal fact sheets and the latest, Nanshiungosaurus (number 807) is currently being checked before final approval. The illustration ready for our Nanshiungosaurus fact sheet. Next up on the CollectA unboxing video (part 1) is the horned dinosaur Mercuriceratops and JurassicCollectables lets the viewer take in all the exquisite details on this model. The Metriacanthosaurus replica follows and it is great to see CollectA making a model of another type of British Theropod dinosaur. Last but not least we have the two 1:40 scale dinosaur replicas that have come out in the first part of this year. There is the 1:40 scale feathered Beishanlong and to conclude this video, the CollectA 1:40 scale Torvosaurus is shown. This model seems to be the narrator’s favourite and what a splendid dinosaur model it is too. In the video review, reference is made to the articulated jaw and in the comments section on the YouTube video we added further information about this feature. Just some of the fantastic CollectA prehistoric animal models new for 2016. We look forward to the next part of this CollectA unboxing video (CollectA new for 2016 part two), from JurassicCollectables. First into the office this morning and it has benefits, pick of the biscuits and a chance to read the latest edition of Prehistoric Times magazine (spring 2016), that arrived over the weekend and what a jam-packed, splendid edition it is. The front cover features Carnotaurus artwork by Kurt Miller which dovetails nicely into an informative feature on this, perhaps the most famous of the abelisaurids, by the talented Phil Hore. Phil begins his article with a short fantasy piece before providing a detailed biography of this long-legged hunter from South America. The article is illustrated with copious amounts of reader submitted artwork. As Prehistoric Times editor, Mike Fredericks freely admits, he was somewhat overwhelmed by the number of Carnotaurus illustrations he received for this issue. It’s hard to pick a personal favourite, Todd Mills gave his Carnotaurus a bright yellow throat pouch, whilst Ashli Lenox’s drawing was very reminiscent of the Papo Carnotaurus replica – all great stuff. A special mention goes to Wade Carmen for providing a beautiful illustration of the skull of this Late Cretaceous predator. The front cover of “Prehistoric Times” magazine. Weaving its way through issue 117, like the ossified tendons associated with caudal vertebrae on a Edmontosaurus, is a super article all about the ground-breaking palaeoartist Zdeněk Burian. John R. Lavas, the writer, has provided a comprehensive guide to this famous Czech painter’s legacy and of course there are lots and lots of examples of his spectacular artwork. Tracy Lee Ford gives budding artists a bit of head’s up in the second part of his thought-provoking feature regarding how to illustrate feathered dinosaurs. Readers of this quarterly magazine might remember that in issue 116 Tracy called for a curtailing on the amount of feathered dinosaur drawings being produced, this time, the focus is on feathered Theropods and how to interpret fossil feather impressions. The article concludes with some well drawn sketches including an interpretation of the recently described Dakotaraptor steini. “Tracks in Deep Time” features in a Mesozoic media review. Lots of new books get reviewed including Tracy Lee Ford’s first fiction novel (did he get the idea from co-contributor to Prehistoric Times, Phil Hore we wonder)? There is also the chance to learn a little about a newly published textbook all about the amazing trace fossils from the St George Dinosaur Discovery Site (Utah). Look out also for a tour of Philadelphia’s Academy of Natural Sciences, fossil news stories and more reader art, in what is a very full edition. Last but not least, a quick mention of the three-page spread dedicated to the Cherilea range of prehistoric animal models, a range that can claim to be Britain’s first dinosaur set. In production, as far back as the late 1950’s, author and model dinosaur Anthony Beeson pays tribute to these trail blazers. The birds that are around today, might have the seed-eating habit of an ancestor to thank for enabling their kind to survive the extinction event that saw the demise of the dinosaurs. 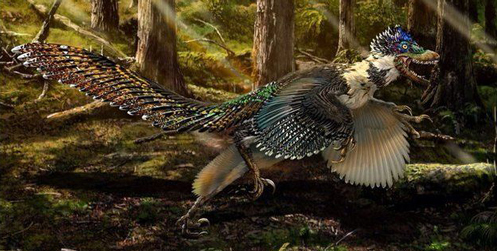 A study published in the scientific journal “Current Biology” suggests that whilst the meat-eating and insectivorous feathered Maniraptoran dinosaurs did not survive into the Tertiary, toothless, beaked birds may have coped with the devastation that wiped out 70% of all terrestrial vertebrates, by eating seeds. The study, conducted by scientists from the University of Toronto and the Royal Ontario Museum, involved the analysis of 3,104 Maniraptoran fossil teeth from eighteen different sites in western North America (Montana, USA and Alberta, Canada). Late Cretaceous North America – Survival of the Seed Eaters? Study suggests the evolution of a toothless beak ideal for seed eating may have had evolutionary advantages at the end of the Cretaceous. The beautiful illustration above, depicts an imaginary scene in the forests of Late Cretaceous North American (Maastrichtian faunal stage). There were probably large numbers of Maniraptoran dinosaurs represented by numerous families but these types of dinosaur along with the toothed birds did not survive the End Cretaceous mass extinction. Those members of the Maniraptora clade that had evolved an edentulous (toothless) beak capable of holding, manipulating and cracking seeds may have had an evolutionary advantage. In the picture above, a large dromaeosaurid dinosaur pursues a toothed bird in the background, whilst a smaller dromaeosaurid pounces on an unsuspecting lizard resting on a log. Emerging from the hollow log is a hypothetical, toothless bird, closely related to the earliest modern birds. Many scientists believe that after the extraterrestrial impact that marked the beginning of the end for the non-avian Dinosauria, the impact threw up huge amounts of dust and debris into the atmosphere. This would have blocked out sunlight, leading to a nuclear winter with plant populations (reliant on photosynthesis to make food), crashing. The loss of the plants led to a collapse of the entire food chain. The plant-eaters would have died out and once there were no carcases left to scavenge, the meat-eaters would have perished too. This new paper is one of a number of recent studies that attempts to explain why some types of animals survived, whilst other, often closely related species did not. The Maniraptora fossil record (dinosaurs and the birds) is very incomplete. The research team knew that they only had a limited number of fossils of Late Cretaceous Maniraptorans to examine and that in all likelihood there were many more species living towards the end of the Age of Dinosaurs than have been identified to date. In addition, there was very little direct evidence of fossil species surviving the extinction event. So to help unravel the puzzle as to why some animals died but their close relatives survived, the scientists examined the fossil record of isolated teeth. Shed teeth tend to be more robust than the delicate and light bones of Maniraptorans and they are more numerous, so the research team had a more substantial data set to work with. The team concluded that seeds would have survived the global devastation that occurred. Seeds already in the ground would have been available as a food source for anything with a beak capable of eating them. In August 2014, Everything Dinosaur published a study which had been conducted by an international team of researchers that looked at the rapid evolution and diversification of the Maniraptora. These dinosaurs evolved very rapidly and probably made up a significant proportion of the terrestrial vertebrate fauna in a number of Late Cretaceous ecosystems. The challenge to palaeontologists is to find fossil evidence of seed-eating birds being prevalent prior to the End Cretaceous extinction event and then evidence of radiation and diversification in strata laid down in younger sediments deposited beyond the famous K-T extinction boundary. This very interesting piece of research raises a number of other questions. For example, a number of Cretaceous small mammals would also have very probably eaten seeds, just like many kinds of small mammals do today. Could seed-eating also have helped several different types of mammal survive the extinction event? Given the success of the Maniraptora and their diversity it seems peculiar that no member of the Dinosauria evolved to take advantage of seeds as a source of food. Many members of the Maniraptora were small, around the size of many seed-eating birds today, why weren’t these dinosaurs also able to take advantage of this food source to help them endure the nuclear winter? No evidence of teeth adapted to seed-eating were found in the study. The picture above shows a typical selection of the shed teeth used in the fossil study. Four different types of Maniraptoran were incorporated into the study. Firstly, there were the Troodontidae, (top left) with their proportionately broader and much more prominent tooth serrations (denticles), an example of a typical Late Cretaceous North American Troodontidae would be Troodon inequalis. Secondly, there were members of the genus Richardoestesia (top right). These Maniraptoran dinosaurs are known from a pair of jawbones and many shed teeth, two species have been assigned, based on tooth differences. Then there are the dromaeosaurids (Dromaeosauridae). The teeth tend to be much more finely serrated than troodontid teeth and a typical North American dromaeosaurid would have been the two metre long Saurornitholestes langstoni. 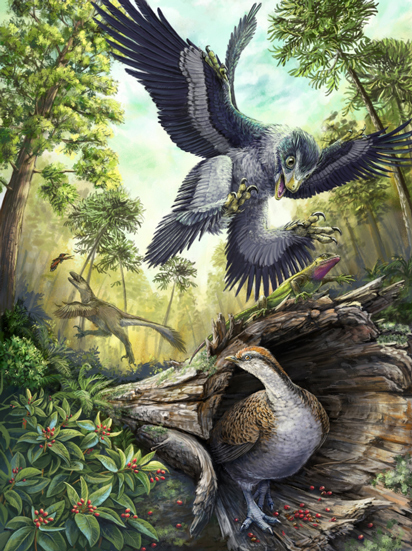 Even though only a handful of fossil bones ascribed to Aves (birds) have been found in places such as the Dinosaur Provincial Park (southern Alberta), those bones that have been discovered indicate that some volant (flying) birds as big as modern-day raptors existed during the Late Cretaceous. Many examples of teeth from toothed birds are known from the Dinosaur Provincial Park, and at least three types of Neornithine birds have been described. This research, that examined Maniraptoran teeth across the last 18 million years of the Cretaceous, supports the idea of a sudden extinction event and the survival of Neornithine lineages as a result of some forms having evolved to exploit seeds as a food source. Today, April 23rd, is the saint day in England (and in a number of other countries), of St George. St George is famous for slaying a dragon one of a number of stories and legends associated with this figure who was believed to have been a Roman soldier and become a martyr following his execution for refusing to denounce his Christian faith in the year 303 AD. St George’s Day is traditionally celebrated on the 23rd April as this is thought to have been the date of his execution. The St George and the dragon legend was brought back to Europe by Crusaders. Dragons and dinosaurs are synonymous, after all, the Chinese dragons, which actually pre-date St George by several hundred years were probably thought up to explain the large fossil bones found in many parts of China. Those early Chinese scientists were remarkably close to the truth. The dragon myth was very probably inspired by the discovery of dinosaur fossils. Whilst delivering a dinosaur themed workshop in school at Oasis Academy (Short Heath, West Midlands), one of our fossil experts was shown a display of model dragons made by the children. It certainly was a wonderful display. The Chinese word for dragon is translated as “lóng” or “long” and given the plethora of Chinese dinosaur discoveries over the last fifty years or so, it is no surprise that a number of Chinese dinosaur genus names refer to dragons, examples being Dilong, Guanlong and the recently described (2015) Zhenyuanlong suni (see picture below). Zhenyuanlong suni – Known from Lower Cretaceous deposits of Liaoning Province, north-eastern China. Very probably a ground-dwelling predator. As far as we at Everything Dinosaur are aware, the majority of the dinosaurs named “dragon” in China are representatives of the Theropoda. There are exceptions, for example the basal Ceratopsian Yinlong (the name means “hidden dragon”. In the case of Zhenyuanlong suni, the name translates as “Mr Zhenyuan’s sun dragon”. The genus name honours the person who was able to acquire the fossil material for the scientists to examine. The Latin term for dragon is “draco”. There are a number of non-Chinese dinosaurs with the “draco” prefix, Everything Dinosaur team members were able to list five genera*. It seems when it comes to the Latinised form “draco”, western scientists tend to apply this term to a wider range of dinosaurs, not just predominately Theropods. Dracopelta – An Ankylosaur named from Late Jurassic-aged fossil material found in Portugal. The genus name means “dragon shield”. Draconyx – A very poorly known Iguanodont, also from Portugal. The name translates as “dragon claw”. Dracorex – A North American Pachycephalosaur named by school children. The name means “dragon king”. Can you name other dinosaurs which are named after the Latin term for dragon? Now that’s a challenge to get your teeth into on St George’s Day. Today, the 46th commemoration of Earth Day, some 171 nations signed and ratified the historic Paris Agreement on climate change. In essence, the Agreement sets out that the global increase in temperature will be limited to no more than around two degrees Celsius as countries work together to cut greenhouse gas emissions, widely believed to be responsible for a rapidly warming Earth. Some fifteen nations had already signed this international accord prior to today, mainly small island states in the Pacific, but with the addition of the 171 signatories, this is a record number for a new treaty. The Paris Agreement sets out a global action plan to put the world on track to avoid dangerous climate change by limiting global warming to well below 2°C. Although, the implementation of the agreement will not be easy and several countries, including a number from Africa and central Asia have not signed, if the Earth continues to warm, then our own species could well be threatened. Extinction of the Dinosaurs Will the Human Race Go the Same Way Due to Global Climate Change? Unless there is a proactive plan to tackle global climate change a mass extinction event cannot be ruled out. One of the authors of the research into the decline of the dinosaurs, that we reported upon yesterday, Dr. Sakamoto, pointed out that the research into the demise of the Dinosauria might have a significance with regards to what we are experiencing today. If the UN General-Secretary calls this a “race against time”, then this is one race that the human race cannot afford to lose. This week has seen the publication of a splendid piece of research by scientists from Reading and Bristol Universities. The research team, which included lead author Dr. Manabu Sakamoto and his colleague Dr. Chris Venditti (Reading University), along with Professor Mike Benton (Bristol University), conclude that far from a sudden and abrupt end to the Dinosauria, as a result of a culmination of catastrophes around sixty-six million years ago, the dinosaurs were already on their way out. In fact, according to their calculations, the dinosaurs had been in decline for the previous fifty million years. Scientists suggest a slow decline for the dinosaurs. The debate regarding whether the Dinosauria declined very rapidly or whether they were in a long-term, terminal decline, has raged for decades. Everything Dinosaur team members remember a study undertaken into the diversity of the dinosaurs from the Hell Creek Formation. This study calculated the number of different types of dinosaur associated with different layers of rock. It was concluded that at the point where the non-avian dinosaurs disappear from the fossil record (K-T boundary), there were much fewer species present then in rock strata that represented slightly older sediments. The overwhelming dominance of horned dinosaurs and Hadrosaurs compared to other types of dinosaur preserved in the bedding planes studied, also suggested a relatively unhealthy balance in the ecosystem. Two years ago, Everything Dinosaur reported on another piece of research that concluded that the demise of the dinosaurs was a result of “bad luck and bad timing”. The difficulty with a debate like this is that palaeontologists do not have a complete data set to work with. The fossil record is simply not complete enough to provide definitive proof, one way or another. It’s not just that there are not enough body and trace fossils of dinosaurs around from the Cretaceous, but scientists have very limited information on other types of fauna, the mammals for example. Mammalian diversity may have been very apparent had you or I been able to travel back in time and wander through the temperate conifer forests of northern Laramidia for example, but in the absence of a time machine, we have to work with inadequate and far from complete information. However, in this paper, perhaps for the first time, Bayesian analysis has been applied to assess the evolutionary dynamics in terms of how quickly the dinosaurs were able to evolve into new species to replace other species that had died out. The scientists find that their Bayesian analysis provides overwhelming support for the theory of a long-term decline across all three sub-clades of the Dinosauria (the Ornithischia, Sauropodomorpha and the Theropoda). The rate of new species development slowed down over time and this was ultimately overtaken by the species extinction rate tens of millions of years before the Cretaceous mass extinction event. Or putting it another may, that extraterrestrial object that smashed into the Gulf of Mexico was tens of millions of miles away when the dinosaurs actually began to die out. A Slow Decline According to the Statistics – Dinosaurs Did Not Go Out with a Bang! Cataclysmic impact event that led to the extinction of the dinosaurs? It’s complicated, named after the mathematician Thomas Bayes (1701-1761), Bayesian analysis is a statistical methodology that takes into account the absence of complete data. By looking at the existing information, a more complete picture can be built up using information inferred from the data that you do have. Bayesian analysis relies upon interpretations of probability which are based on degrees of belief. There are a number of different forms of analytical technique that can be applied based on these principles. If you have all 24 pieces then it is easy to put together the jigsaw puzzle and see 100% of the picture. BUT… if you were to ask another person to complete the puzzle but only gave them 12 pieces (50%), then that person would only have half the data to work on. To solve the puzzle, that second person would have to examine the patterns made by the 12 pieces, to look at their shapes, their size, their colours and to use their existing knowledge about what the complete picture might be in order to compensate for the lack of all the jigsaw pieces to play with. Using the Schleich Mini Dino Landscape “Discovery” Set seen below as an example, the second person would have to infer from the information available what the completed jigsaw puzzle would actually look like – this is essentially what Bayesian analysis permits you to do. Green Velociraptor, Torosaurus, Stegosaurus and Quetzalcoatlus are included in this Schleich jigsaw puzzle set. The Bayesian analysis shows that the Sauropodomorphs, the long-necked, super-sized herbivorous Titanosaurs were declining the fastest, whilst the Theropods (mostly meat-eaters), were declining at a more gradual rate. Plotting the demise of the dinosaurs. The graph above is intended to illustrate that, in this new Bayesian analysis, the Sauropodomorpha clade was shown to be declining most rapidly. The Theropoda was in decline but the speed of de-speciation was lower and the Ornithischia was also in decline too but the rise of the Hadrosauriformes (duck-billed dinosaurs) and the rapid diversification of the Ceratopsidae (horned dinosaurs), temporarily bucked the downward trend. The only exceptions to the general trend are the Cretaceous herbivores, the duck-billed dinosaurs and the horned dinosaurs. These two types of dinosaur show rapid species proliferation throughout the Late Cretaceous. However, the research team conclude that overall, the Dinosauria showed a marked reduction in their ability to replace species that had died out with new species. This made the dinosaurs vulnerable to extinction and unable to evolve quickly enough to allow them to recover from the catastrophic events that mark the end of the Mesozoic.